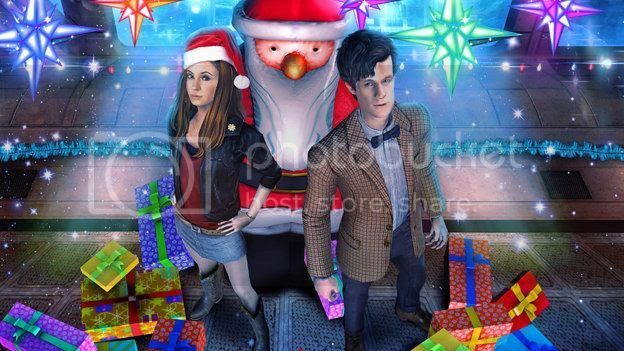 Doctor Who in the Media: BBC Press Release: Guess Who's coming for Christmas? The BBC Press Office have released details on the fourth game in the Doctor Who Adventures, Shadows of the Vashta Nerada. This Christmas Day, Doctor Who fans are in for an extra special treat as the BBC releases the fourth and final episode in this series of the ground-breaking Doctor Who – The Adventure Games immediately following the BBC One and BBC One HD broadcast of the Christmas special. The game will be available for UK households on PC and Mac as a free download from the Doctor Who website (www.bbc.co.uk/doctorwho). Entitled Shadows Of The Vashta Nerada, this fourth episode sees the first appearance of Steven Moffat's brilliantly original monsters since their debut in Silence In The Library and Forest Of The Dead. Executive produced by Steven Moffat and written by Doctor Who writer Phil Ford (Shadows Of Mars, Torchwood), the game sees the return of Matt Smith and Karen Gillan in digital form as the Doctor and Amy face their biggest adventure yet. Kicking off immediately following the cliff-hanger ending of episode three, Shadows Of The Vashta Nerada sees The Doctor and Amy have materialised just south of London (and about a 1,000 miles to the left) inside an aquatic sea-bed colony called Poseidon. The game features a breath-taking plot which surrounds a real-world conspiracy – and, of course, takes place at Christmas. "We've gone all-out for the season finale," says Steven Moffat. "Shadows Of The Vashta Nerada takes place entirely underwater – something which would be impossible for the TV series, as water is so expensive. It's thrilling, terrifying, educational and fun. Just steer clear of those shadows..."
Doctor Who – The Adventure Games have been produced by a team drawing on the very best talent from TV and gaming. The interactive episodes are executive produced by Steven Moffat, Piers Wenger, Beth Willis and with Anwen Aspden (BBC Wales Interactive), alongside Charles Cecil, one of video gaming's most revered creators. The games are being developed by Sumo Digital, one of the UK's best game designers. Stories and scripts are from Phil Ford (co-writer Doctor Who Waters Of Mars) and James Moran (Doctor Who, Torchwood Children Of Earth). The project has been commissioned for BBC Online by the Vision Multiplatform team and is being driven by BBC Wales Interactive. Shadows Of The Vashta Nerada will be available simultaneously on PC and Mac from the Doctor Who website (www.bbc.co.uk/doctorwho) on Christmas Day. The game will be available for no extra cost to UK households. Users outside the UK will be able to purchase and download it on the same date – details will be put on the Doctor Who website. Doctor Who – The Adventure Games will return in 2011.